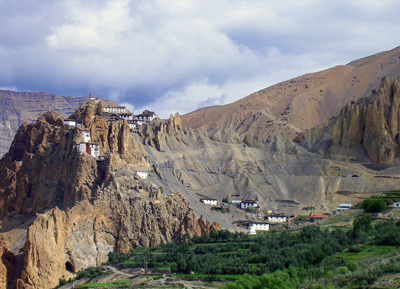 The beautiful Dhankar Village is one of the most stunning attractions in Lahual and Spiti Valley, a home to the most beautiful and awe-inspiring Dhankar Monastery and Dhankar Fort that are perched on the top of the hill in Dhankar. 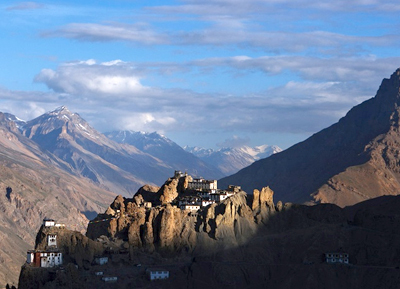 Dhankar is located in the cold desert of Spiti Valley and looks like a bowl-shaped structure in the hills. It looks almost as if all the old Dhankar houses and fort have emerged straight from the mountains with their back wall being merged on the hill. 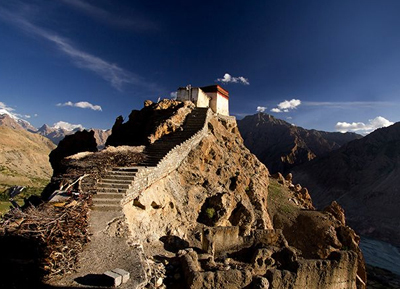 History The Dhankar village is known for the existence of Dhankar Monastery and Dhankar Fort, that werebuilt as a fort monastery in the Central Tibetan pattern. The monastery is located right below the Dhankar Fort, which is built on a 300 meter high spur, and there are beautiful wall paintings, available inside the monastery that tourists can see on their expedition. It is one of the world's most amazing settings for a fort; however, the ground of this village is very weak due to erosions caused by wind and rain, and the Dhankar Fort is on the stage of worsening because of soil erosions. Highlights The view of Dhankar Fort, which has been declared among the 100 most endangered sites in the world, is captivating and a lot of visitors come here to capture the beauty of this stunning attraction. This fort is perched just above the Monastery with the key structure supported on a cliff base. One can reach Dhankar Fort through a Motorabe road, which leads to a passage to climb towards the fort. . The view of Dhankar Lake from the Dhankar Fort is simply remarkable and tourists can have a wonderful time indulging in pleasures such as photography and sightseeing. 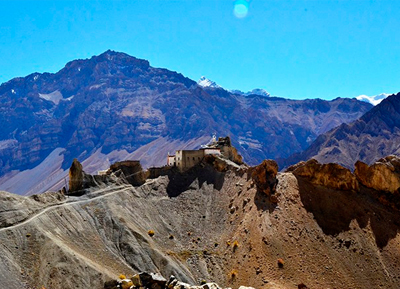 The repeated attacks from mongols and the destructions caused has left the fort of Dhankar in ruins, but still it is a place worth visiting as from the remnants of the fort, one can see vast expanses of Spiti Valley.